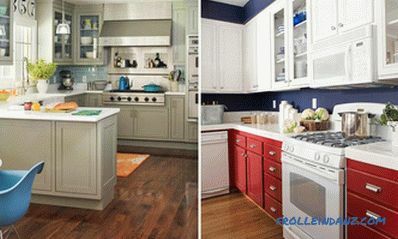 This collection of colorful kitchens will inspire you and tell you how to mix and match different colors and shades in the interior of your kitchen. The right combination of colors in the interior of the kitchen is not an easy task, but in this case the designers coped with it perfectly. This magnificent spacious kitchen is full of light. It is the abundance of natural light, which is additionally underlined by the ceiling trimmed with white boards and white furniture, and create a feeling of spaciousness. The blue color of the island table creates a contrast to its snow-white marble tabletop. Metal handles on cabinets and drawers give the room an exquisite shine. Shine also emanates from the bluish-gray tile, which lined the kitchen apron. 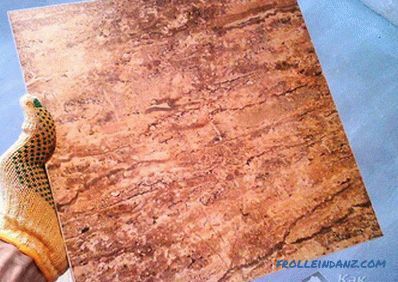 A reddish brown floor adds warmth to the kitchen space, which is clearly not enough in this abundance of cold colors. The contrast between ultra-modern cabinets and aged wood makes this kitchen inimitable, one-of-a-kind. Production roughness, present in the appearance of the room, is emphasized by simple metal lamps, steel stools and bright apple-green color of furniture. If it were not for the abundance of sunlight, there might be a desire to quickly expel all dark wood from this kitchen in order to get rid of the feeling of being in the old warehouse. However, not only natural light, but also white panel walls are beautifully contrasted with old wood on the ceiling and floors. Parquet floors give this kitchen a simple style in which, at first glance, modern household appliances and others are not very fit here are the elements. White ceramic tile "Metro", popularly referred to as "hog", and shining white countertops challenge the dark blue cabinets. 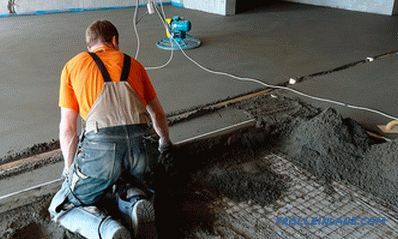 The shiny steel handles, which are an attribute of professionalism and high quality, relieve this stress. And the abstract chandelier with its pure white color and intricate lines adds a touch of sophistication and sophistication to this room. 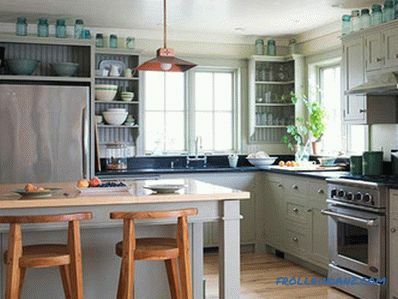 The combination of burnt orange and very light greenish blue makes this kitchen unique. The warmth of orange walls and dark wood floors is adjacent to cool blue and creamy white shades. 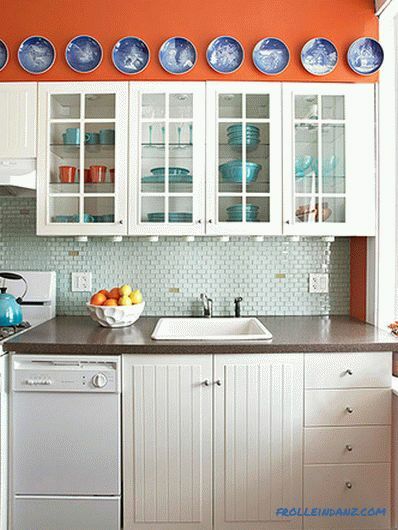 Turquoise and orange dishes in glass cabinets repeat the colors of the kitchen. 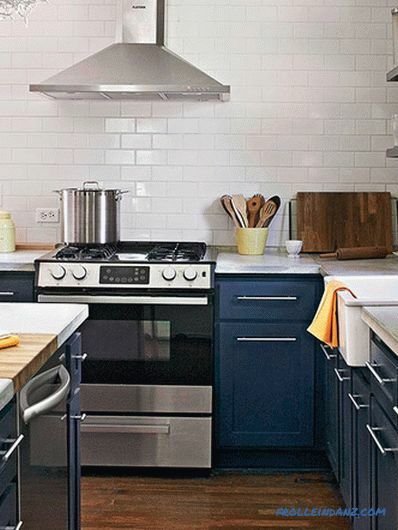 And porcelain dishes placed above the cabinets create a splash of somewhat unexpected indigo color here. 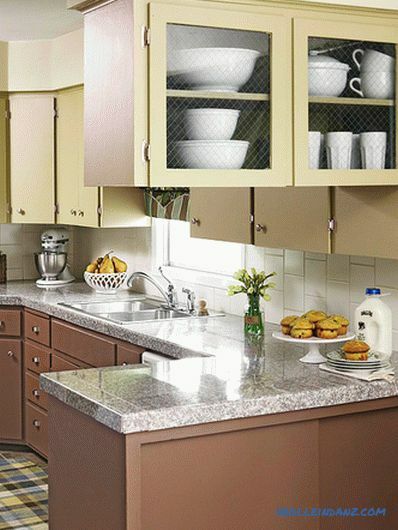 A unique combination of copper and cream colors gives the kitchen a fresh, modern look based only on natural shades. Handcrafted iron lamps above the island table add another metal to the combination of copper exhaust hood and stainless steel gas stove and water tap. The unique character of the cutting surface of the island table is created by using recovered chestnut wood for its production. The mosaic apron consists of dark chocolate, cream, copper-red tiles with a slight impregnation of blue. 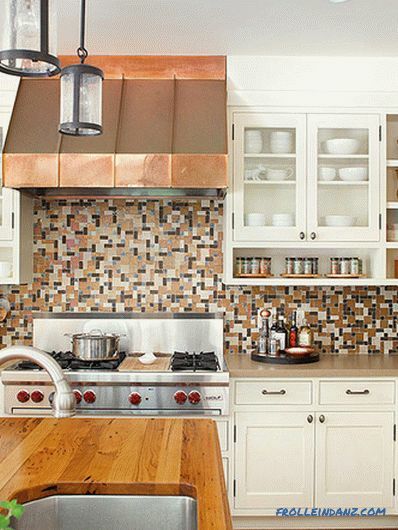 Copper theme can be traced in the rest of the kitchen, which is largely facilitated by the numerous copper pots and other kitchen utensils. Selection of various half-tones and shades of blue creates in this kitchen a color palette of water inspiration that soothes and pacifies. 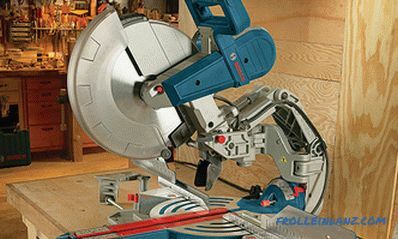 Against the cobalt blue of the tabletop, the blue color of the cabinet fronts is lost, and they appear almost white. The yellow-brownish tint of the tabletop of the island table and the wooden floor gives rise to associations with the color of the sand - a suitable "neighbor" for the surrounding cool tones of water. A pair of copper pendant lamps and wooden bar stools add warmth to the interior of the kitchen. The combination of gray and white seems soft and soothing until you add accessories and color accents to it. In this bright, reviving kitchen, which creates a feeling of tranquility, there are elegant red porcelain plates placed on an open shelf integrated in a gray kitchen set in a shaker style. 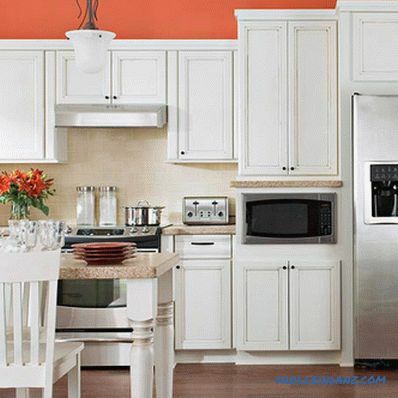 White dishes are stored behind the glass doors of the cabinets, but red will also look harmonious there. The imitating brick white ceramic tile "Metro", from which the apron is made, serves as a graceful framing of the faucet's goose-neck. The combination of yellow and green colors is often associated with tropical heat, but when iridescent glass mosaic, stainless steel is added to this mixture, polished black granite and brass, you get something exotic.The gray-gray island table with a stainless steel tabletop gives the interior a certain foundation. 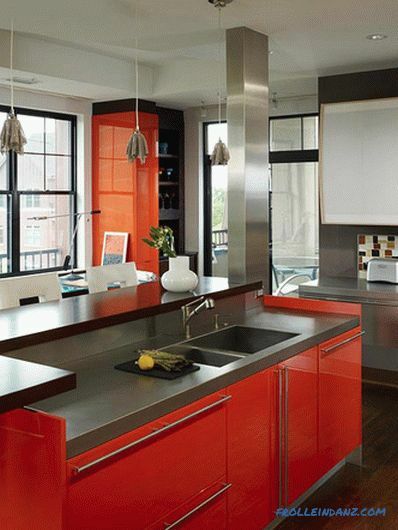 This stunning modern kitchen combines bright orange cabinets with black and gray countertops and dramatic black window frames, but while it does not give rise to associations with Halloween. Suspended lamps made of steel mesh and a column of stainless steel add shine to the room, although they have completely different textures. 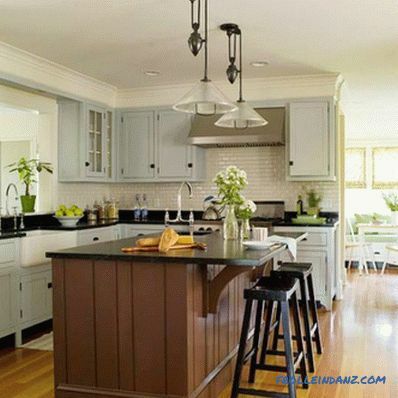 The soothing tones of gray, brown and black in the interior of the kitchen create an atmosphere of naturalness. 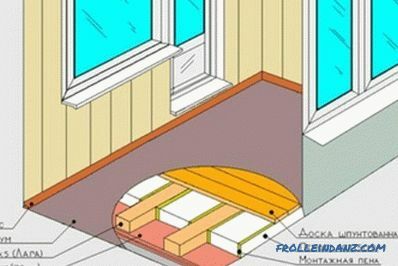 The same sensations arise when looking at the honey-colored wooden floor. Additional touches of black bring furniture and bar stools to the interior. Bright orange walls create a dynamic background for the white cabinets with ledges with eye-catching black furniture located on the ledges. 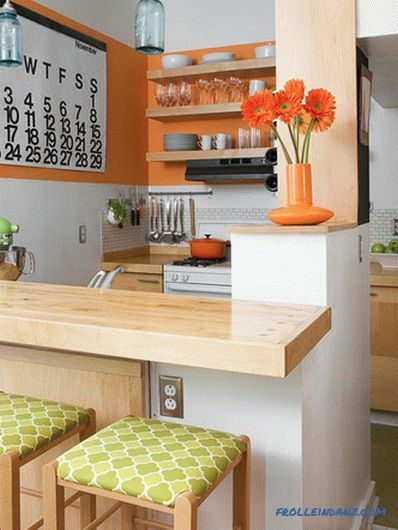 Against the background of warm neutral tones of the tabletop and apron tiles, the bright orange color looks especially catchy and impressive and attracts attention to wooden cabinets. 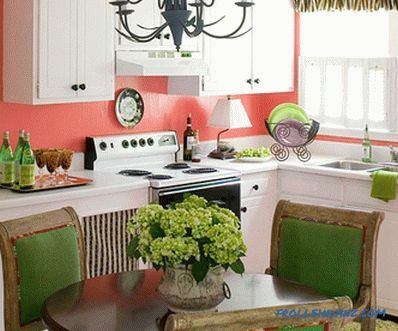 The colors that were needed to make this kitchen a fantastic, bizarre look, it seems, were found on one of the impressionist canvases. Bright shades literally overwhelm the space - here there are warm coral walls, cold green upholstery of chairs, and a greenish-yellow rug. 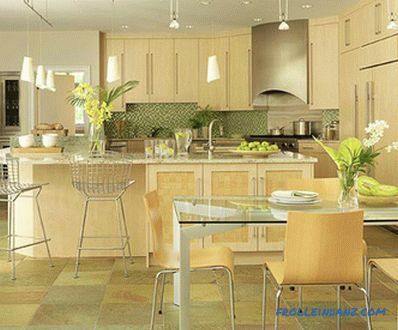 However, white cabinets and small black accents do not allow this tropical palette to become overwhelming. The striped fabric on the cabinet doors adds a bit of playful mood to this explosive mixture. 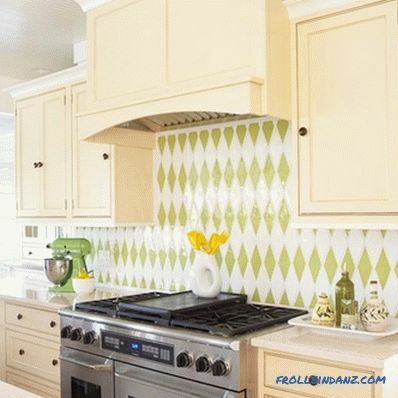 Golden yellow cabinets and beige artificial stone worktops allow the pale green and white colors of the patterned apron tiles to dominate this sunny kitchen. Thanks to the huge windows this kitchen in cool colors is filled with sunlight, which prevents it from becoming dreary; a desolate cave-like space. Purple walls and black cabinets coexist with stainless steel, glass and snow-white accents, which gives the room a feeling of freshness. 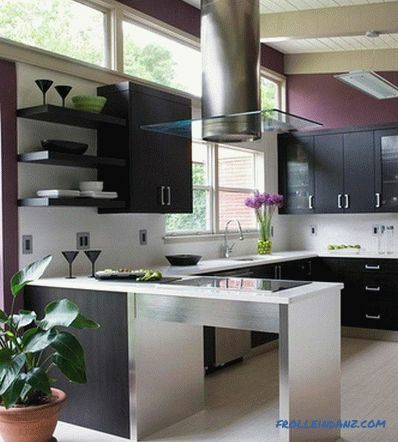 Stainless steel products add vibrant luster and disperse unnecessarily dark interior colors. 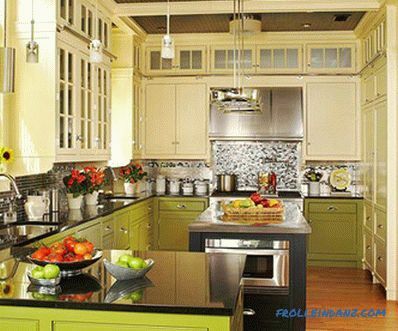 Cabinets and shelves made from natural processed maple, make this kitchen somewhat ordinary, but the citrus shades of orange and green give it a special personality . The white color of the walls, the tiles of the apron and the electric stoves create a feeling of spaciousness in a tiny room. 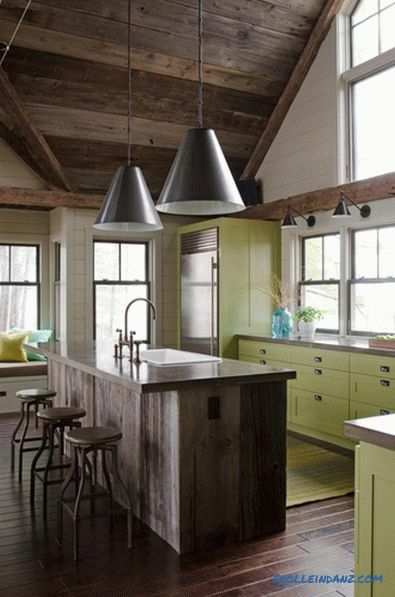 Sage greens and maple gold abound in this modern kitchen. They are everywhere - from the brilliant mosaic of an apron to the variegated floor tiles. Maple chopping tables are topped with a granite tabletop, creating a neutral background that allows neutral tones accessories — white chandeliers, frosted stainless steel lamps and aluminum bar stools — to shine. To create a classic color palette, white is often combined with red or blue accents. 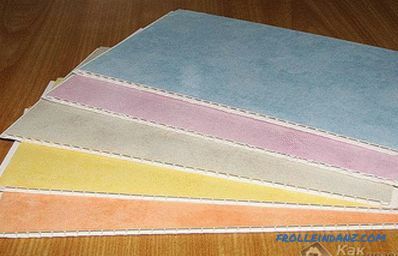 The decision to use a combination of these colors in the interior of the kitchen will require you to have self-confidence and readiness to live with bright colors throughout the year. 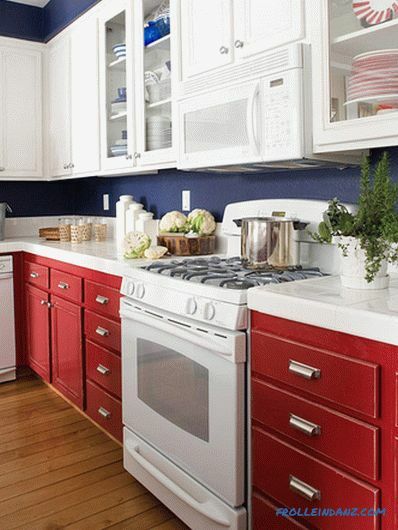 Here the bright blue wall serves as an excellent contrast for the facades of kitchen cabinets - white on top and red at the bottom. 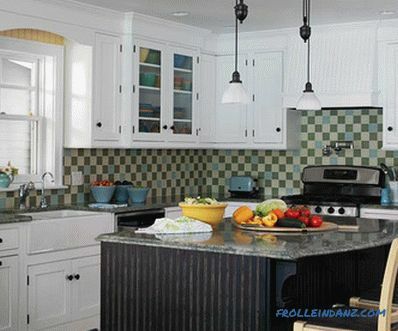 Behind the glass doors of the cabinets there is a dishware that repeats the color scheme of the entire kitchen. 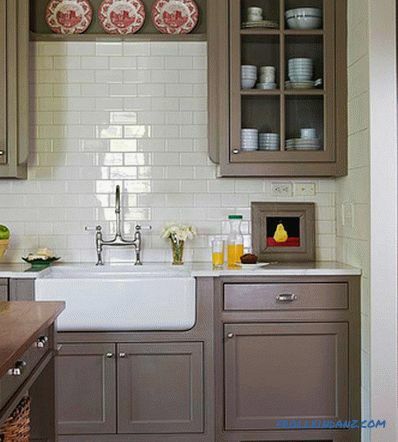 This practical kitchen, in which cocoa-colored bottom cabinets are combined with grayish-green upper ones, creates a soothing atmosphere. Motley granite countertops and vertically arranged rectangular white apron tiles add a touch of sophistication to the room. The checkered rug is not so elegant, but it charges space with energy. Gray cabinets, white worktops, and sky-blue Metro tiles in this kitchen create a sense of calm and serenity. 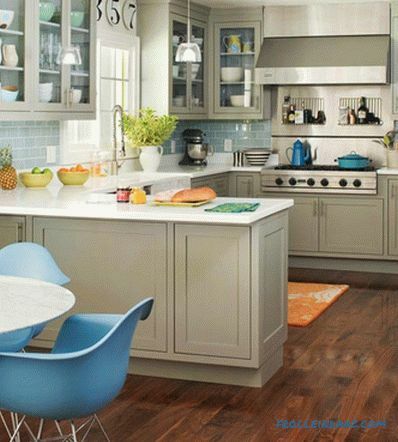 The back walls of the cabinets painted in blue are an excellent background for your favorite dishes. A lively, relaxed atmosphere in the dining area helps create a dark-blue chair located there. 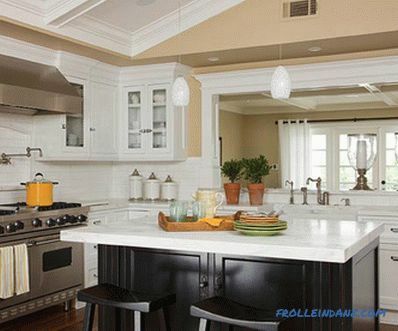 This kitchen is classic in all respects, and this is underlined by its elegant white cabinets, coffered ceiling and warm yellow brownish walls. Black island table serves as a kind of anchor of space. 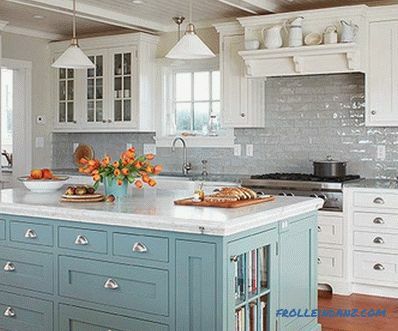 White marble countertops and apron tiles create a sense of integrity and connectedness of all interior elements.Wire inserts in the doors of the upper cabinets framing the hood add a bit of rustic style to this abundance of classics. Classic white cabinets take on a new look thanks to the blue, green and beige apron tiles located above the green-gray granite worktops. Covering the yellow boards above the window adds a splash of sunlight and improves mood, and dishes of various shades behind the glass doors of the cabinets create a grand celebration of color in this kitchen.